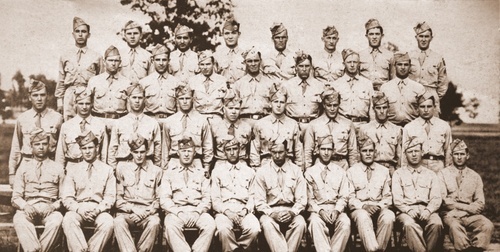 The 466th Airborne Parachute Field Artillery Battalion was activated on August 1, 1943 at Camp Mackall, North Carolina under the command of Lieutnant Colonel Raymond L CATO. 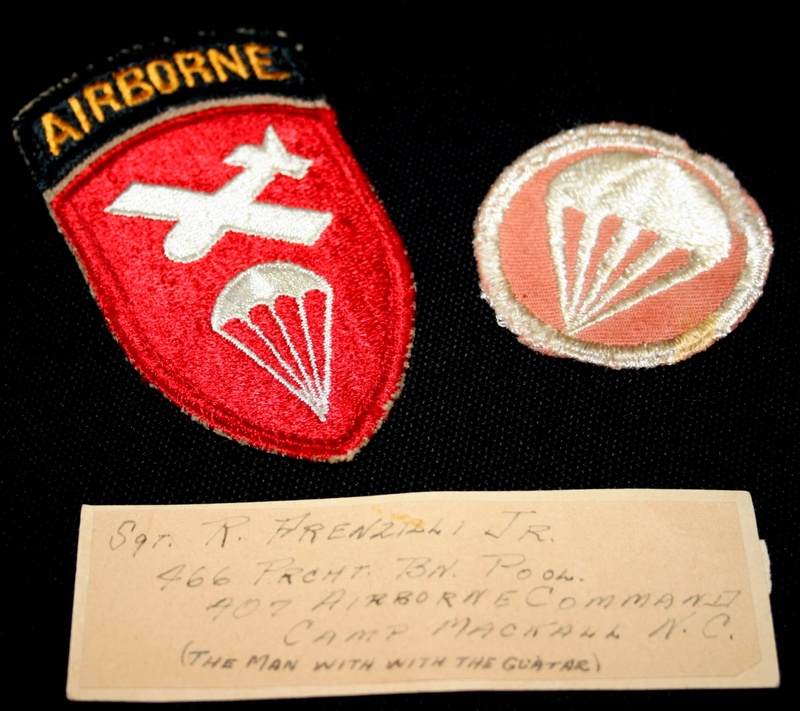 At this time, the unit was attached to the Airborne Command. 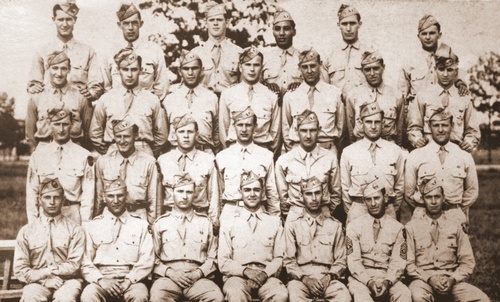 The officers and Enlisted Men of the new unit came predominantly from the Jump School of Fort Benning, Georgia and from the Replacement Center of Camp MacKall. It is at Camp MacKall that the young recruits completed their Basic training and were qualified paratrooper after four jumps (wich two night jumps). The unit was involved in the Tennessee maneuvers from March 4, 1944. 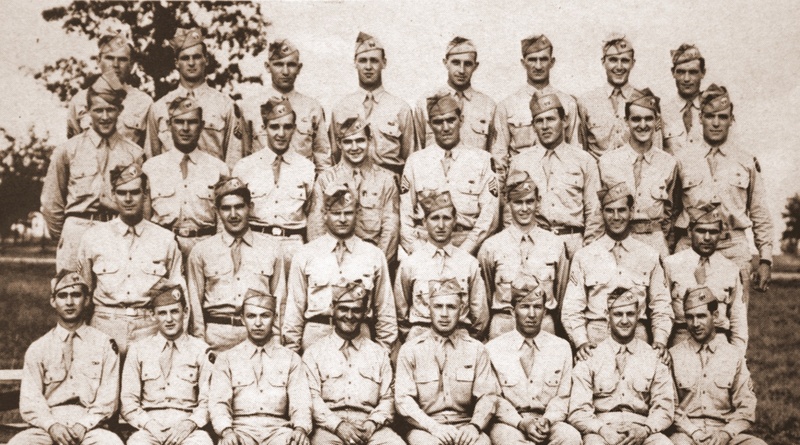 On March 10, 1944, the 466th PFAB was relieved from the Airborne Command and attached to the 17th Airborne Division. 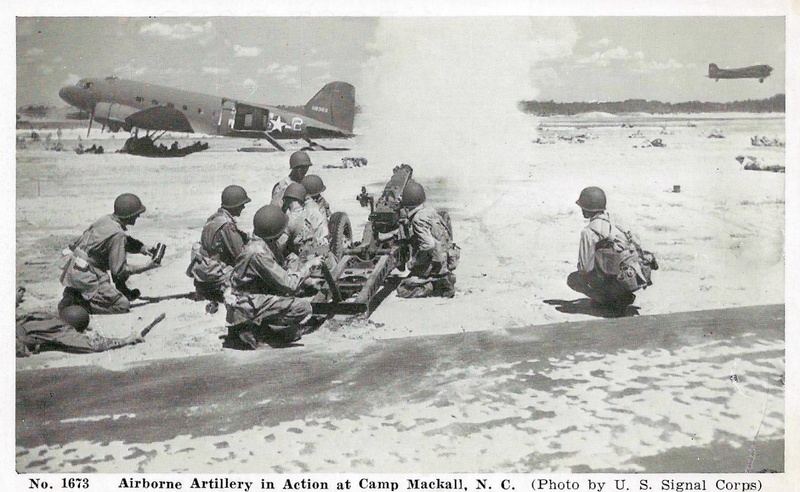 This post card shows Airborne Artillery in action at Camp MacKall, N.C. It was printed by W.R. THOMPSON & COMPANY, PUBLISHERS, RICHMOND, VIRGINIA during WWII (TFH collection). 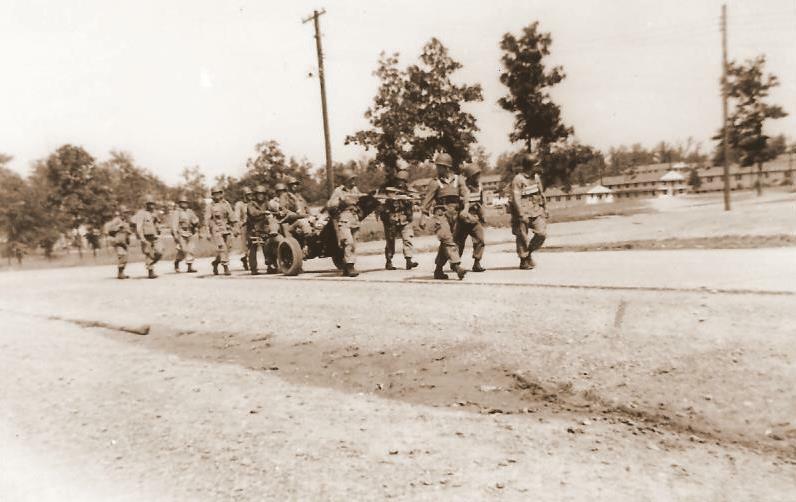 On March 25, 1944, the 466th Airborne Parachute Field Artillery Battalion was sent at Camp Forrest, TN to pursue its advance training. One of the aim of the training with other units is to developped Combat Team fighting. The Battalion realised three more training jumps (wich one night jump). 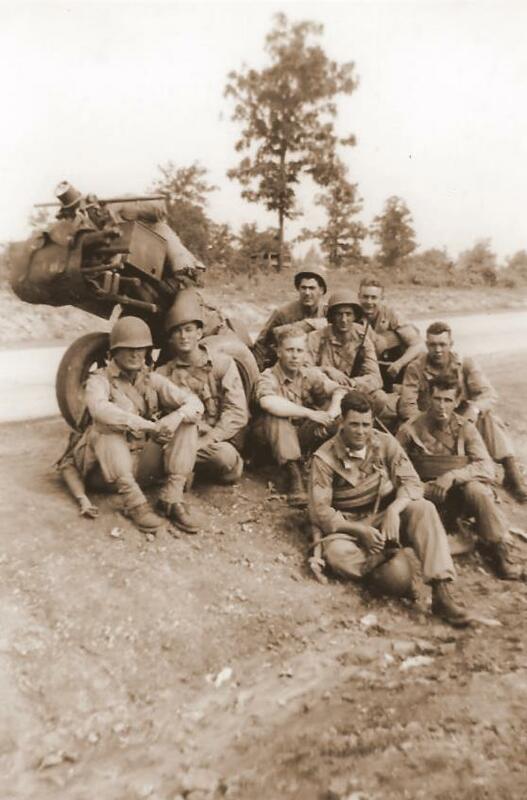 Men of the 466th Airborne Parachute Field Artillery during training (Camp Forrest). 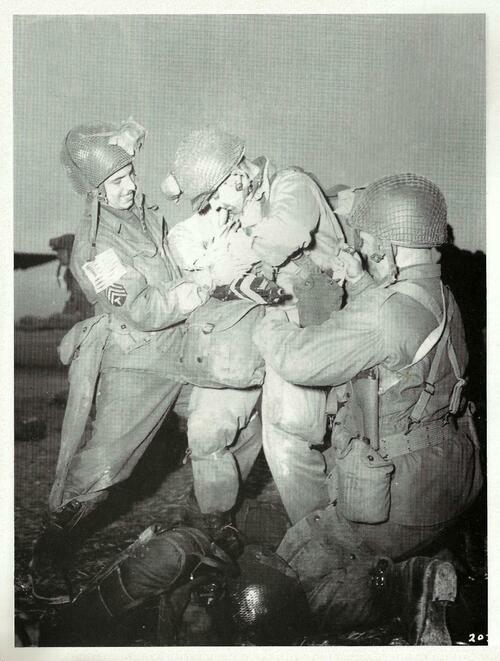 The photo comes from the book "17th Airborne Division Volume 1". 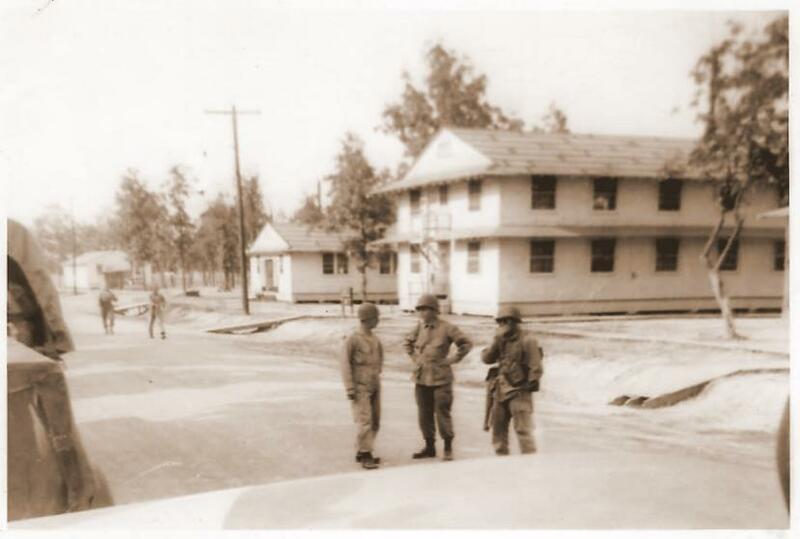 It is a Camp Forrest that Lieutnant Colonel Raymond L CATO was transferred to the 460th PFAB and replaced by Lieutnant Colonel Kenneth L BOOTH (ASN O-24519) (photo opposite). 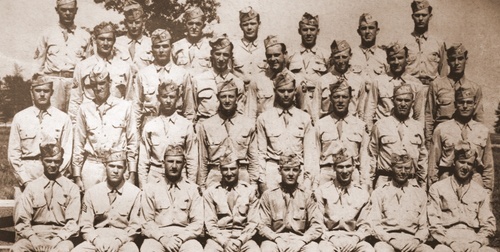 First row (bottom), last on the right : John A CHESTER. 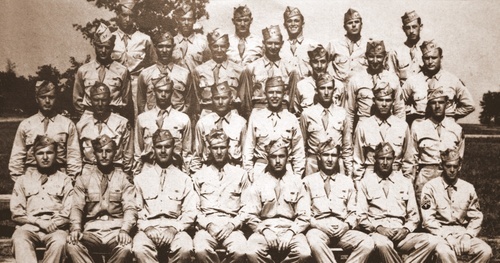 Third row from left : second : George S MEYERS (ASN 32628914), fifth : Romeo J CASHERA. These six photos come from photo album of George S Meyers - A Battery (ASN 32628914). They show men of A Battery during training, during maneuvers at Camp Forrest, summer 1944. George Meyers is identified on the third photo (squatting man on the right) and on the fourth photo who shows the gun crew (behind on the right, without helmet) (unpublished photos - with courtesy of Michael Meyers). This photo comes from the photo album of Francis E WALSH - Battery C 466th Parachute Field Artillery Battalion. No info about the date or place on the other side. Just three names : STEVER, ... and WALSH. STEVER is probably James F STEVER (original unpublished photo - TFH collection). 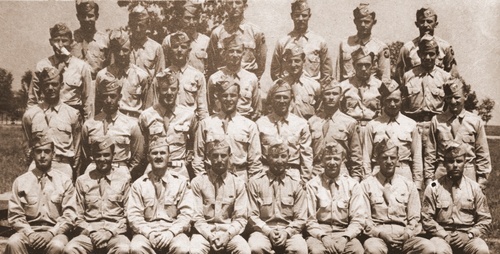 On August 12, 1944, by Special Order No 159 Paragraph 11 (Headquarters 17th Airborne Division) dated July 22, 1944 (you can see original copy of this Order in the "17 A/B history" chapter) the unit received order to make a secret movement toward Miles Standish Camp in Tauton (near Boston), Massachusetts. It arrived on August 16 and prepared its travel for England. On August 20, the men of the 466th Parachute Field Artillery Battalion boarded on the USS Wakefield in Boston harbor. They arrived in Liverpool on august 28 after an 8 days travel. Approximately on August 30, 1944 the Battalion took position in its new location at Chiseldon Camp near Swindon, Wiltshire. The training restarted up to December. 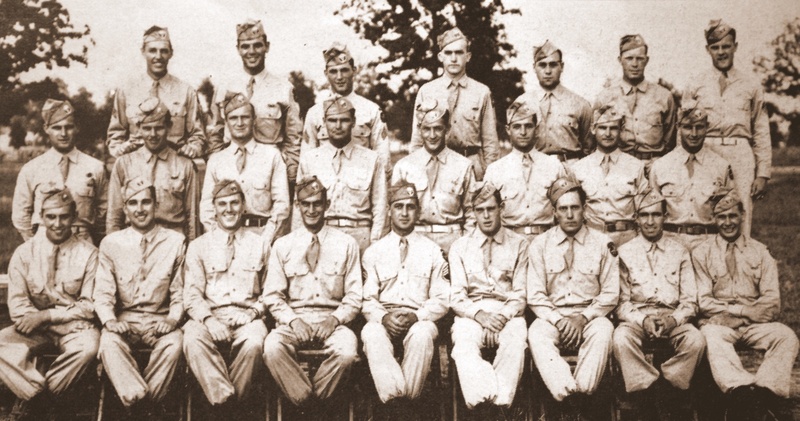 In August 12, 1944, the 17th Airborne Division was integrated in the XVIIIth Airborne Corps. 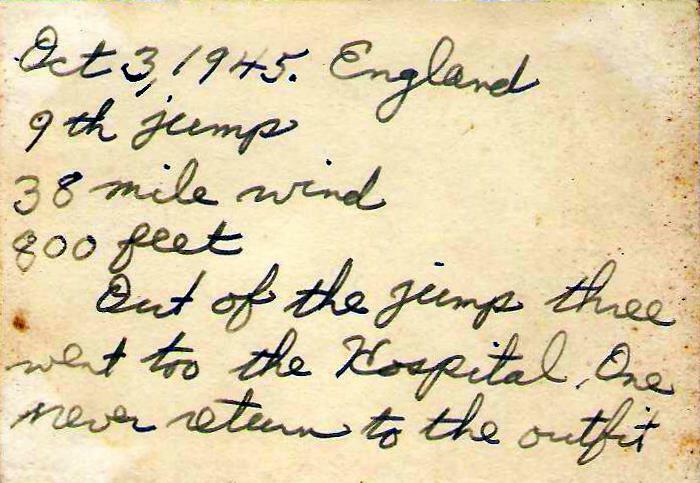 On Tuesday October 3, 1944, 19 men were wounded during a jump training realised despite an heavy wind. One man, the Corporal John KURKA Jr (ASN 33107985) died. 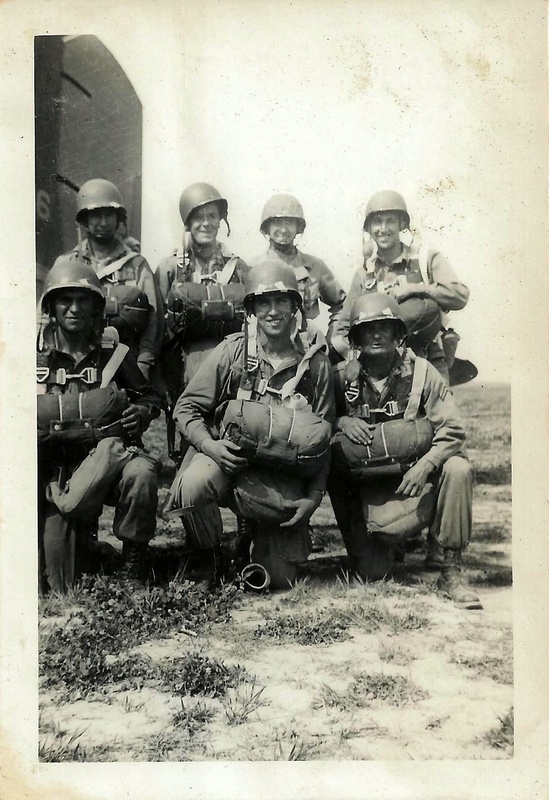 This historical photo shows men of A Battrey few minutes prior the jump. 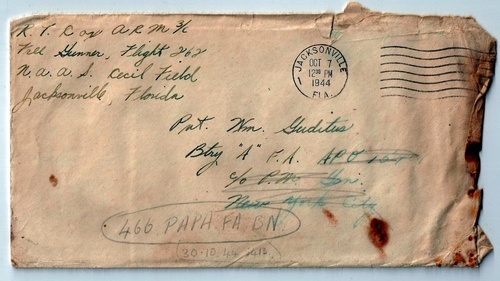 On the reverse side is note "Oct 3, 1945 (it is in fact 1944 !) 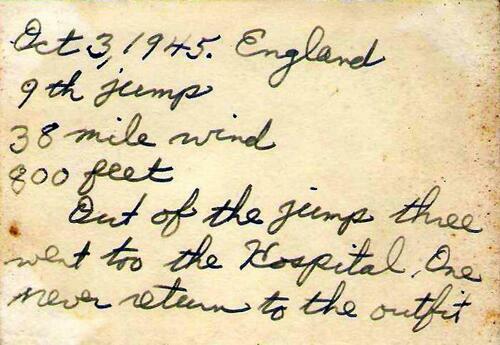 - 9th jump, 38 mile wind, 800 feet - Out of the jump three went tp the hospital, one never return to the outfit". This man is Cpl John KURKA Jr (unpublished photo with courtesy of Michael Meyers). 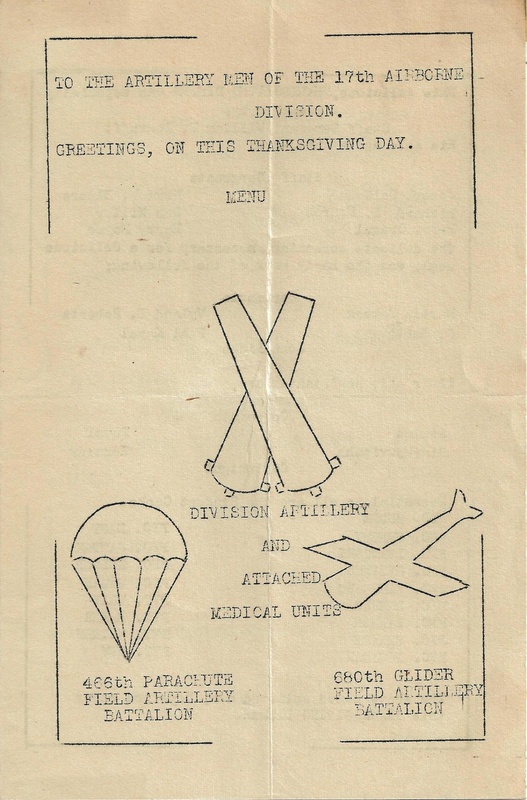 This is an exemplar of 1944 Thanksgiving menu (November 23) for the men of the 466th PFAB while they were stationned at Camp Chiseldon. On the third page, you can read "This is your first THANKSGIVING DINNER in the ETO. The folks back home would like to know that you will eat hearty today. Save this little menu CARD, and send it home in your next letter. Let the folks know you were thinking of them." This exemplar belonged to John A Little Hq Bty - Div Arty (ASN 33507120) (TFH collection). Following the outbreak of the german counter offensive in the Bulge, the entire 17th A/B was placed in alert on December 19, 1944. After three days of intensive preparation, the 466th PFAB was ordered to join a marshalling area located in Greenham Commons airfield on December 22, 1944. This place is located approximately 2 miles (3.2 km) south-southwest of Thatcham, about 27 miles (44 km) east of Chiseldon and was the house of the 438th Troop Carrier Group. After several delays due to weather conditions or urgent air supply of the surrounded units of Bastogne, the Battalion took off from England at 12h30 on Friday December 29, 1944. 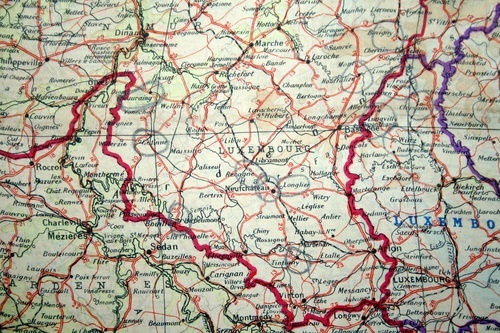 When arrived in France, the whole 17th A/B division was assigned to the 12th Army Group and received the mission to defend the west bank of the Meuse river. The Battalion was immediately send in the French military Camp of Mourmelon (near Reims) where it arrived approximately at 17h00. Barely arrived, the men were send to Verdun for defend the Meuse river (with the 3rd Battalion of the 513th PIR). On Monday January 1, 1945, the Division moved to Belgium. On Tuesday January 2, 1945, the 17th Airborne Division was alerted to move to the active front line and on Wednesday January 3, 1945 it moved before the starting of the day to the front line. At this time, the 466th PFAB was located in the vicinity of Sibret (Province of Luxembourg, Belgium). The next day, January 4, 1945, the Battalion received the first ennemy artillery fire. On January 7, 1945, the 466th PFAB moved to Chenogne. It is at this place that the unit suffered its two first casualties. One of these man is probably the Private Nicholas TOCCI (ASN 31224062) who was killed in action on Monday January 8, 1945. 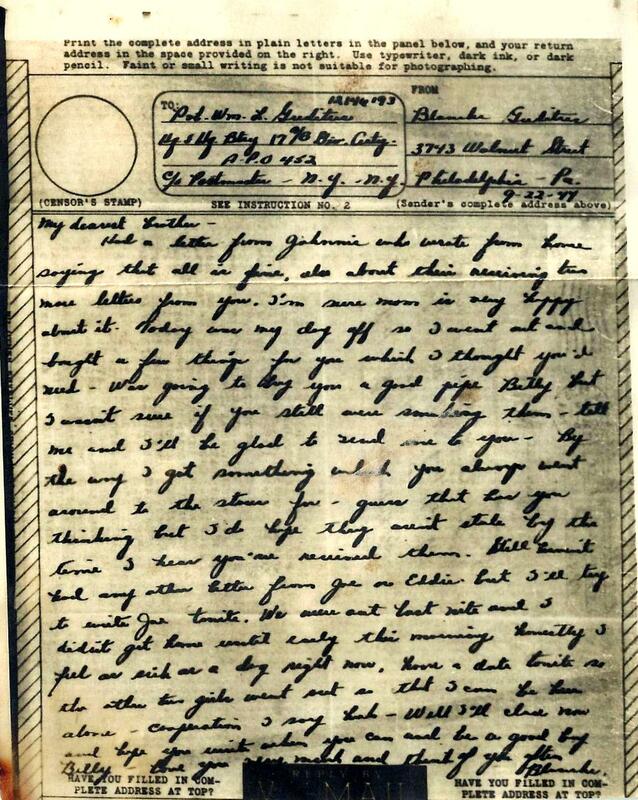 This letter and this V-mail were found in the vicinity of Bois des Valets (Chenogne) after the battle by a civilian poeple who lived in the area. 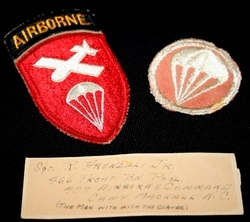 They belonged to William L GUDITUS (ASN 12146193) who was artillery forward observer for the 513th PIR during the battle of "Dead man ridge" (TFH collection). - January 14, 1945 : Frenet. - January 17, 1945 : Mabompré. - January 20, 1945 : Houffalize. - January 21, 1945 : Cetturu. - January 22, 1945 : Steinbach. - January 24, 1945 : Limerlé. This day, the Corporal Edward A PLISH (ASN 33569049) was killed in action. 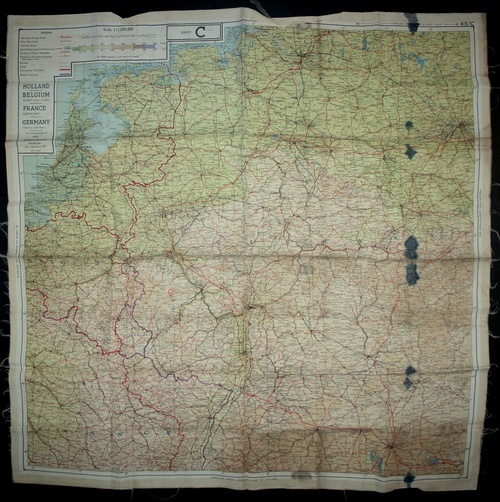 - January 25, 1945 : Wattermal. January 26, 1945 was the offical date of the end of the Battle of the Bulge. 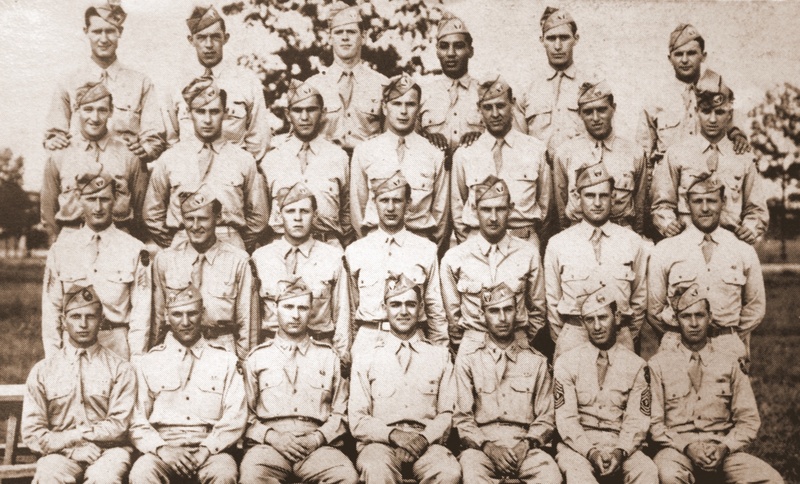 The Officers and Enlisted Men of the 499th PFAB enterred so in the Rhineland Campaign. - January 27, 1945 : Deiffelt. - January 28, 1945 : Munshausen (first step in the Great-Dutchy of Luxembourg). 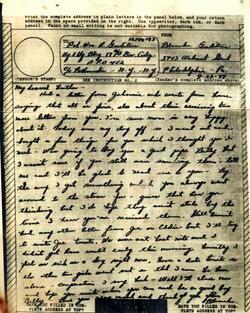 - January 29, 1945 : Marnach. On February 10, 1945, the Corporal Robert L RANDALL (32525825) was killed in action. The Battalion stayed in this position until the Division was relieved from the front line on February 12, 1945. This photo extracted from "TALON with the 17th in Ardennes"shows the Staff Sergeant George H Loss with one buddy fighting during the battle of the Bulge (TFH collection). This silk map belonged to Capitain "Doc" Loran B MORGAN (ASN O-515568), the Battalion Surgeon. 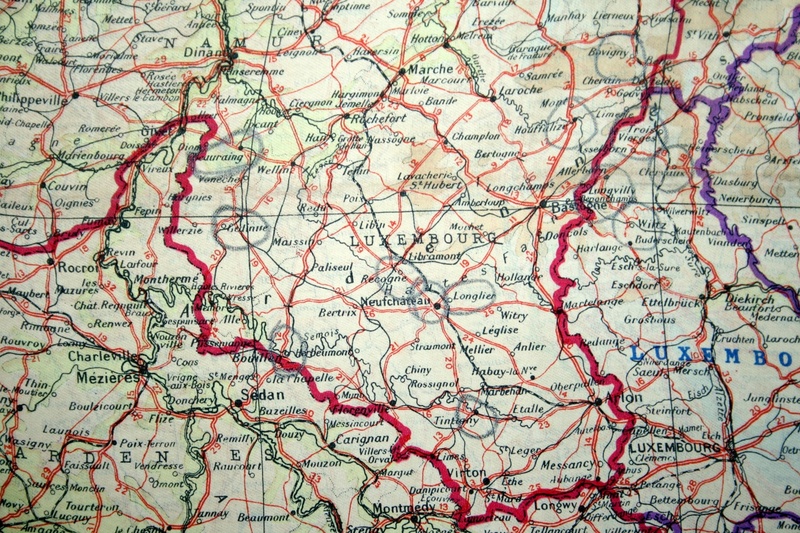 Interistingly Doc MORGAN has noted his travel on this map and you can see on the part showed above the way used by the Battalion to join the front line and after during the Battle of the Bulge and Rhineland Campaign : Givet (France), Beauraing (Belgium), Gedinne, Bouillon, Tintigny, Neufchâteau, Longlier, Recogne, Longvilly, Houffalize, Bovigny, Trois-Vierges (Great Dutchy of Luxembourg), Clerveaux and finally Wiltz (TFH collection). In early February, the 466th Parachute Field Artillery Battalion leaved the front line for a new assembling area located at Sondron, in the vicinity of Châlons-sur-Marne, France. It is at this place Battalion dressed its wounds and resupplied in preparation of the biggest airborne operation of world war II. On March 19, 1945, in preparation for operation Varsity, the 466th PFAB was alerted and joined a marshalling area located in the vicinity of Mourmelon. 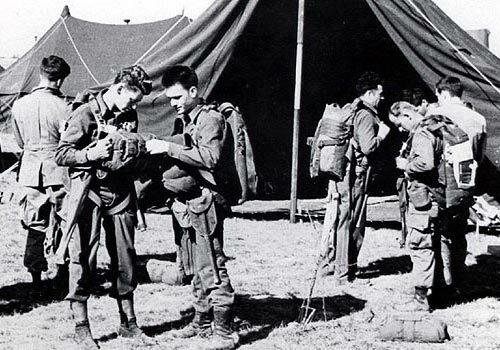 In the early morning of March 24, 1945 troopers of the 466th Parachute Field Artillery Battalion prepare their equipment for the first combat jump of the unit (National Archives). 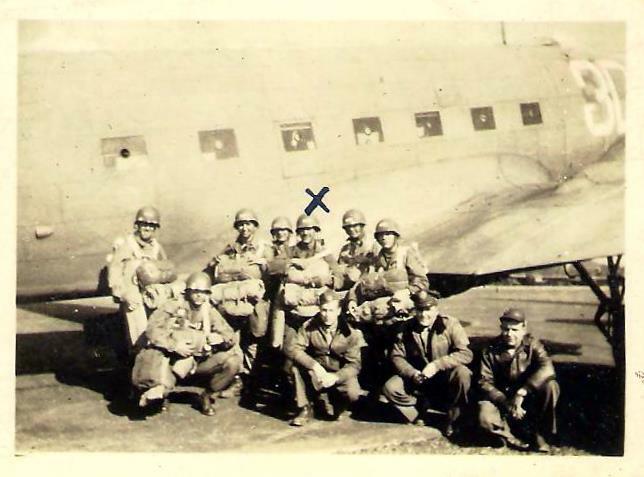 According to the After Action Report of the unit, the men of the 466th Parachute Field Artillery Battalion loaded into 42 C-47 air planes of the 434th Troop Carrier Group (9th Troop Carrier Command) at 08h00 on March 24, 1945. 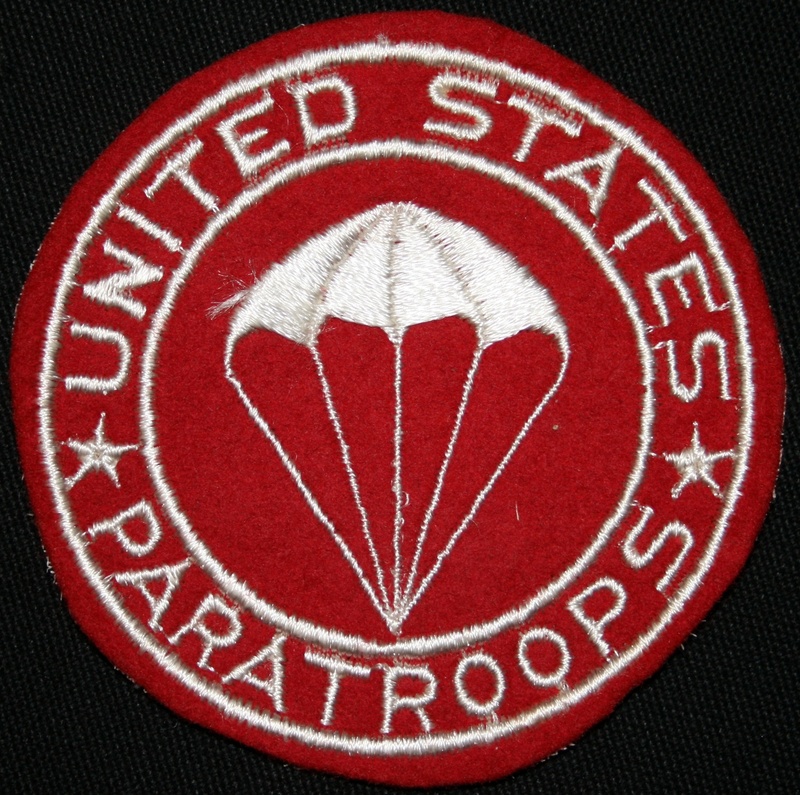 The mission of the battalion was direct support of the 513th Parachute Infantry Regiment which was to precede the 466th PFAB on to the same drop zone. In addition to the 42 C-47 airplanes the battalion had men and equipment loaded into a total of 17 CG4A Gliders. These gliders were divided into two groups at separate departure fields. 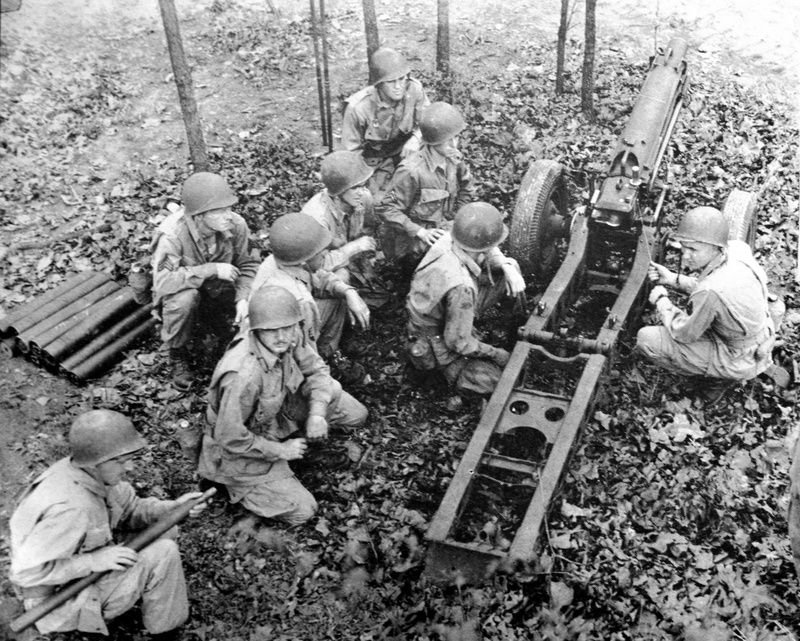 One group of three gliders containing three 75mm howitzers was assigned to come in with the glider element of Division Artillery Headquarters Battery. 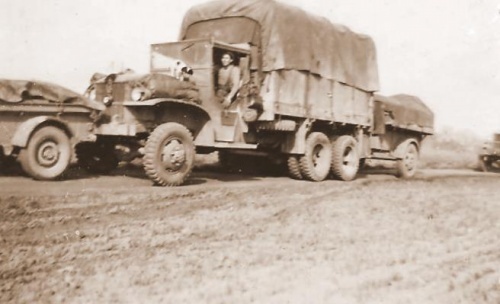 A second group of 14 gliders containing 1/2 ton trucks and trailers as well as SCR 193, SCR 608, SCR 694 radios was assigned to come in with the glided transportation of the 513th PIR. The jumping element of the battalion consisted of 27 officers and 356 enlisted men, passed over the Rhine River at 10h20. At 10h25 1/2 the planes had reached the designated drop zone and the green light was given to release the loads and jump the sticks. 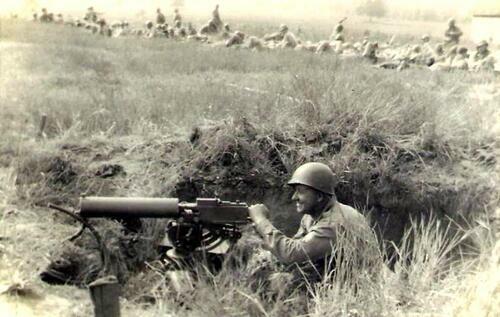 Between the river Rhine and the DZ medium to heavy flak consisting mainly of 20mm AA was encountered with the heaviest flak being concentrated in the vicinity of the DZ. 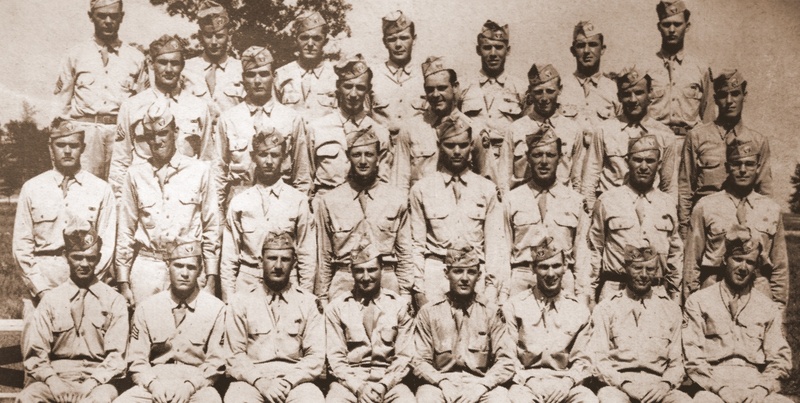 Two enlisted men were wounded by flak while still in the plane and did not jump. A considerable number of equipment bundles were hit by flak but serious damage was encountered only in the case of one howitzer load. The batteries were jumped in the order Headquarters, A, B, C although all batteries in trail jumped at the sight of silk from the leading elements. The accuracy and the general pattern of the drop were excellent. The battalion commander Lieut. 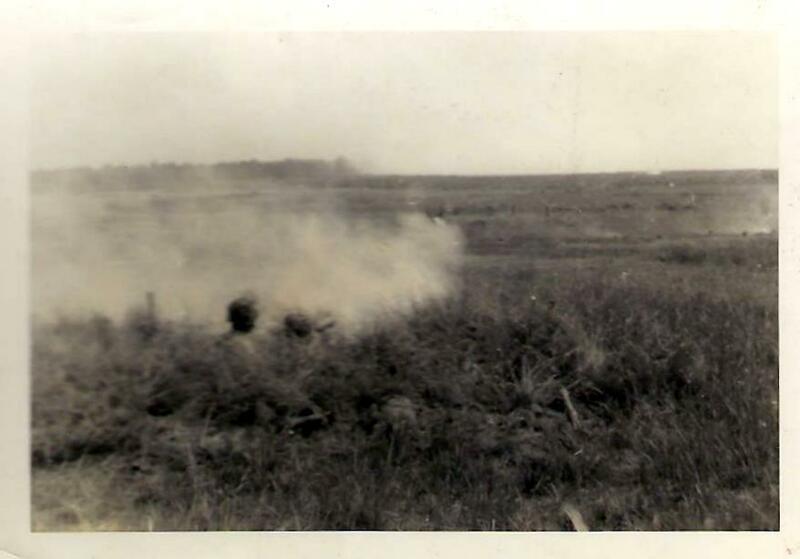 Colonel Kenneth L. Booth, jumping with the Headquarters element landed 20 yards away from a building he had previously selected from photo reconnaisance to be the Battalion CP. All batteries with the exception of "C" battery had a concentrated drop pattern on the ground. Immediately upon landing the battalion encountered stiff resistance by the defending enemy. The situation was extremely serious as the Parachute Infantry Regiment that was suppose to precede this battalion into the drop zone had been dropped in error approximately four miles to the north. It remained for this artillery battalion to perform the infantry task of clearing the drop zone of enemy as well as recovering the equipment bundles and organizing an artillery position. In order to show specific details of the ensuing action the activities of each battery will be taken up separately. The majority of the men landed in close proximity to a group of buildings that had been previously selected as battalion command post. Several men who landed immediately adjacent to the buildings were wounded by small arms fire emanating from the buildings. The battalion commander directed the assistant S-3, Capt Charles McGee, 0-300416 to organize the men in the vicinity and clear the area. In the ensuing action two of the enemy were killed and a total of 23 prisoners were taken. Members of the battery who landed further away encountered sharp skirmishes in making their way to the CP. The platoon Communication Officer 1st LIEUT. JOHN F. STACY 0-010493366 and the Battalion Ammunition Sergeant S/Sgt. Henry Y. Parker, 14002525 with a small group of men encountered intense fire from some 20mm AA positions. By organizing the men and attacking the positions LT. STACY and Sgt. Parker silenced the weapons. The operations Sergeant Tech/Sgt. Joseph Flanagan, 32160342 landed near a fixed artillery piece. Regeting quickly Sgt. Flanagan dashed wildly toward the weapon and succeeded in capturing the crew of six men. This weapon was later used against enemy strong points that offered stubborn resistance. The Battery Commander 1ST LIEUT. RONALD J. MULLIGAN, 0-1170502 was wounded as he was leading a small group to the battalion CP location. When the buildings of the CP had been cleared the personnel of the Headquarters set about to organize the CP. Luckily a SCR 609 radio/bundle had been recovered and it was set up immediately. No replies however were received in answer to the initial call ups. The time was about 11h30. The Fire Direction Center, the Wire Section and the Message Center personnel organized themselves quickly and began immediately to pick up equipment bundles that had landed nearby. The CP installations were beginning to make their appearance. As the fighting in areas adjacent to the CP location quieted down more of the CP equipment was recovered. Additional radios were set up, wire was laid to Battery positions, a switchboard was installed and a firing chart was set up. Radio communication was made with the Regimental Commander of the supported infantry at 12h00 and at that time the friendly situation became clearer. The infantry troops who were supposed to have landed in the same DZ were at that time considerably scattered and were fighting their way to assembly points. It was obvious that several hours would elapse before the infantry battalion could organize and set about reaching objective points. However the Regimental Commander was informed that artillery support would be available to him for any mission. By 13h00 "A" Battery had set up four pieces in position and "B" Battery had three pieces. "C" Battery did not have any pieces in position at this time although two pieces had been assembled. These two pieces were used else where for direct fire missions. Wire communication had been established with both "A" and "B" Battery as well as with a small command group of Division Artillery who had landed by parachute close by. At 13h30 CAPTAIN JAMES M CAKE 0-25372 a Liaison Officer with the infantry called for a fire mission on an enemy strong point in house. The data was prepared at Fire Direction Center and transmitted to "B" Battery who was assigned the mission. The second round, with smoke shell being used, hit the house and set it on fire. Cease firing was given to enable the infantry to take prisoners as the enemy came out of the house. The data from this mission was used for registration. 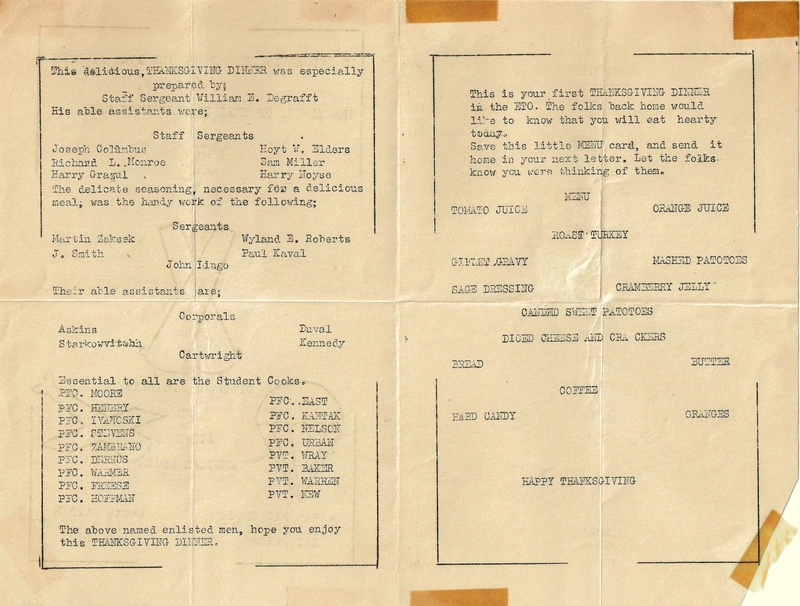 In addition to interior Battalion Radio Communication being set up, Radio Communication was also completed with reinforcing artillery units on the west bank of the Rhine, thru the radio set of the Corp Liaison Officer who had jumped in with the battalion. The contact made was at 12h00 and insured maximum artillery support for any mission assigned to the battalion. By 15h00 Wire Communication was established with "C" Battery who reported three pieces laid and ready to fire. This brought the total up to 12 pieces in the battalion as two more pieces in Baker Battery had been set up. The Battalion Survey Sergeant reported that an orienting line had been established and the position area survey had been completed. At 15h30 personal contact was made with the supported Infantry Regimental Commander who established his command post close to the 466th PFAB CP. Immediate plans were made to continue on with the assigned missions and full artillery support was assured the Infantry Battalion Commanders. All Forward Observer and Liaison Officer parties had by this time checked into the Battalion Radio Net and reported they were with their assigned infantry units. The element of Headquarters Battery that came in by glider began arriving at the CP at approximately 15h00. The SCR 193 and SCR 608 radio/trucks were damaged in the crash landings of the gliders. However, the SCR 694 and second 1/4 ton truck, both hauling trailers loaded with communication equipment landed safely and amde their way directly to the CP. In the clearing of the area of enemy and setting up of the CP Headquarters Battery suffered eighteen casualties including five killed as contrasted to capturing a total of 100 prisoners and killing fifteen of the enemy. Initially the men of this battery encountered extremely heavy small arms fire and were unable to reach their equipment bundles. The Battery Executive Officer, 1ST LIEUT. John L. O'BRIEN, 0-1181393 immediately upon landing gathered the men closest to him and dashed heedlessly toward the equipment chutes intent upon getting the howitzers assembled. LT. O'BRIEN and several men of the group were killed by small arms fire as they crossed an open field on the way to the equipment. CAPT. CHARLES D. DUREE JR, 0-1822249, the Battery Commander began to organize his men as infantry in order to first clear the enemy from their installations. He was seriously wounded while doing this and the command of the battery passed on the First Sergeant George R. Grazel, ASN 6940906. As the enemy resistance was reduced the men procured the equipment bundles and assembled the guns. The first two pieces were assembled by 11h00; the third piece was delayed until 14h00 as it had landed close to an enemy strong point that had been difficult to neutralize; the 4th section was a howitzer that had come in by glider and did not reach the position area until 14h30. The fifth section of their battery had been erroneously dropped with its entire crew on the west bank of the Rhine. 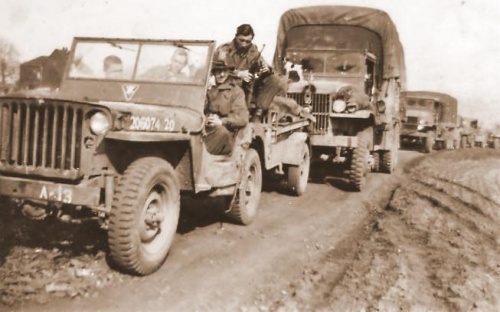 However, the Chief of Section collected his men and equipment, comandeered two 1/4 ton trucks, engaged in heated arguments with the British Forces and made his way over the river Rhine to the battalion position area. The piece was laid ready to fire by 08h30 on the following day. At 12h00 on D-day the Battalion Commander on visiting "A" Battery area discovered that all officers had been killed or wounded. He directed a Staff Officer, 1ST LIEUT. JAMES NAMMACK, 0-388550 to take command of the battery. At 16h30 the Battalion Commander directed that "A" Battery move from its initial position to an area about 200 yards to the south to a position that had been previously selected. The initial position had been occupied as the original planned position was under enemy fire at the time the pieces were assembled. The move was necessary as the three batteries were too close together in their initial positions and would be subject to heavy casualties if subjected to enemy artillery fire. The move was made quickly, the orienting line was extended and additional position area survey was made. In clearing the enemy from its initial position area and occupying a battery position "A" Battery suffered a total of 22 casualties including five killed as contrasted to capturing sixty prisoners and killing 10 of the enemy. As "A" Battery this battery met heavy enemy resistance immediately upon landing. Most of the resistance came from 20mm AA guns that had engaged the airplanes while in the air and then the men as they landed. T/5 Levi Bales, ASN, 2075976 eliminated some of the fire when he crept up close enough to one of the guns and fired a rifle grenade. This round neutralized the gun. First Sergeant John T Bennick, ASN 6895454 and Pvt Dan Morgan, ASN 18044903 eliminated another enemy strong point when they both crashed thru the roof of a house on landing. They took a total of 16 prisoners from the house all of whom had fields of fire on to the area where the battery was intending to set up a position. The first piece was assembled at 11h00, under the direction of Sergeant James E. Guy, ASN 19004931. When moving to the battery area the section encountered the battalion S-3, MAJOR GEORGE ROBIE, 0-372433 who directed Sergeant Guy to take his piece to a hedge row near the CP and take under direct fire a house from which deadly small arms fire had been received. It was the fire from this enemy strong point that killed LIEUTNANT O'BRIEN and several men from "A" Battery as they tried to reach their equipment. Direct fire was used against the building until the ammunition supply gave out. At this point several men volunteered to go out on a fire swept field and recover additional ammunition bundles. When more ammunition was received direct fire was continued until a white flag appeared and 25 prisoners came out and surrendered. After this Sergeant Guy who had been wounded in the meantime led his section to the battery position. By 11h45 "B" Battery had three howitzers laid and ready to fire. The fourth howitzer had landed near "C" Battery area and was not recovered as quickly due to sharp enemy resistance. It was put into position by 15h30. The fifth and last section was the piece that came in by glider and was laid and ready to fire at 16h30. In spite of suffering casualties and the stiff resistance of the enemy this battery made one of the best jumps in its history including training jumps. All of its howitzers were laid and ready to fire in excellent time and all equipment and ammunition was collected. In clearing the enemy from its area and in occupying its position "B" Battery suffered 21 casualties including 13 killed as contrasted to capturing 80 prisoners and killing 10 of the enemy. This battery met the stiffest resistance encountered in the entire battalion area. In addition the personnel were dropped over a considerable distance and were not as well concentrated as the personnel of the other three batteries. Since this battery was in the last airplanes of the battalion column it received a heavier concentration of flak as it passed over the DZ and as the men descended on the DZ. An entire stick of twelve men were all either killed or wounded and it is known that some of these men were hit while in descent. On the ground the men reacted quickly to the enemy resistance and despite the heavy losses succeeded in eventually clearing the area. The first pieces assembled at 11h15. 1ST LIEUT. 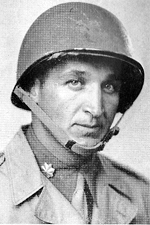 CHARLES DUGGAR, 0-1170349 directed the assembly of one piece and led it to the battalion area. En route he was forced to use the piece to neutralize an enemy strong point in a house. The second howitzer was led by Chief of Section Sergeant LeRoy Haynes, ASN 20514968. En route to the battalion position Sgt Haynes was killed by enemy small arms fire as he observed the results of some direct fire the section had undertaken against some enemy in the woods. When the area had been neutralized the section proceeded to the battalion position. The third piece to be laid and ready to fire was a howitzer that was glided in and reached the battalion position at 15h00. The piece that had landed short of the position area arrived and were laid at 16h00. The fourth piece was finally recovered from a fire sept field and was layed at 17h00. The fifth piece had been dropped in woods held by the enemy until the night of D-day. The piece was recovered and in position at 08h00 on D+1. When the Battalion Commander visited the battery position at about 13h00 and saw the large number of casualties he directed that "A" and "B" Battery send five men each to "C" Battery as additional help. In clearing the area of enemy and organizing its position this battery sufferrred a total of 41 casualties including 24 killed. The battery captured eighty prisoners, killed fifteen and wounded fifteen of the enemy. The Battalion Surgeon CAPT. LORAN MORGAN, 0-515568 jumped second only to the Battalion Commander. In his Headquarters Section were 5 aid men. While each firing battery were two aid men. Two medical 1/4 ton trucks were due to come in with glider lift. Immediately upon landing the entire Medical Section went into action administrating to the wounded. The Battalion Aid Station was established in the CP building by 11h30 hours and within the next five hours a total of 106 casualties were treated with the amazing record of not having one patient die while under their care. The Battery Aid Men perfomed heroic tasks in the field particularly in areas were enemy resistance was so stubborn. The two medical 1/4 ton trucks arrived at the aid station at approximately 14h00. In addition to bringing a welcome supply of plasma and other medical equipment the 1/4 ton trucks were invaluable as litter carriers. With a total of 13 howitzers in position by 17h00 and a complete wire net of communication established the battalion was awaiting fire missions from it Forward Observers with the Infantry. The main effort of the infantry was directed toward a large woods to the west of the Drop Zone. However, enemy resistance by this time had partially disintegrated and due to the large number of wandering friendly units no artillery fire was called for to support this attack which was completed at 19h00. Another infantry objective was the securing of the Issel river to the east of the Drop Zone. 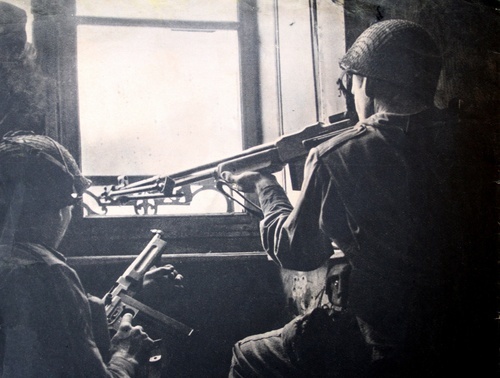 Several fire missions were called for in support of this attack and they were referred to the reinforcing artillery battalions located on the west bank of the Rhine. The reason for this was to avoid shifting the howitzers of the 466th PFAB. on a 3200 mil shift as they were laid in a westerly direction in order to offer immediate support to the attack to the west. The fire mission, however, passed thru the direct support Artillery Fire Direction Center and were relayed to the rinforcing artillery units by the Liasion Officer. During the night of D-day continuous harassing fire was placed in front of our lines on the Issel canal. At the battalion positions a strong perimeter defense was maintained as there were still a great many isolated groups of enemy in the area. During the night a total of fifteen prisoners were taken, five of the enemy were killed and one was wounded. No casualties resulted for the 466th PFAB. On D+1 a final check of the area was made for equipment that had not been collected particularly ammunition containers. The fifth howitzer for "A" and "C" Battery arrived and were placed in position. Strong harassing fires were maintained in front of the line along the Issel canal as the infantry consolidated their gains and prepared for an attack to the east. On one occasion a heavy concentration of fire broke up an ineffective enemy infantry counter attack. The heavy harassing and interdiction fire continued throughout the night of D+1. A review of the activities of the 466th Parachute Field Artilery Battalion showed that the battalion committed an original strength of 27 Officers and 358 Enlisted Men to come in by parachute and a total of 2 Officers and 55 Enlisted Men to come in by glider. 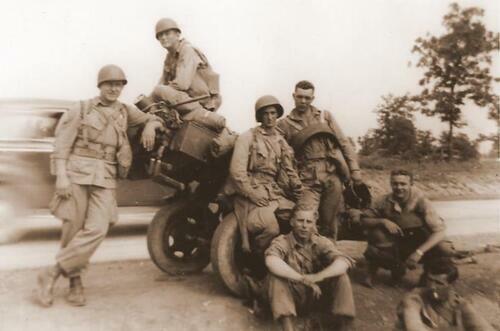 12 howitzers were dropped in parachute loads and three howitzers were brought in by glider. A total of 1550 rounds of 75mm ammunition was also brought in Airborne. Aggregate Casualties 107 Officers and Men. Pfc Ben F. BOURN Jr ("C" Battery). Pfc Robert S DURHAM Jr.
Sgt Leroy L HAYNES ("C" Battery). Pfc John W JESSUP Jr.
Pfc William R JOHNSON ("C" Battery). Pfc Fred C KUHN Jr ("B" Battery). 2/Lt Henry G McDONALD ("A" Battery). 2/Lt John L O'BRIEN ("A" Battery). All of the howitzers that were brought in Airborne were eventually layed in position and fired in support of the infantry. This is the first time a Parachute Field Artillery Battalion has made a combat jump and recovered all of its pieces to fire against the enemy. In addition, almost 100% of the ammunition was recovered. 2. In addition to individual commendations in 1 above, may I also compliment the combat efficiency of your entire 466th Pcht.F.A.Bn., and of its outstanding Commander, LT.COL. BOOTH and his Executive, MAJOR HADLEY. Faced with a most difficult situation they fought rapidly and efficiently as infantry, cleared the DZ of enemy, attacked and secured gun positions and set up for artillery support of infantry before any contact had been made with the infantry. It was a privilege to have been associated with them. As authorized by Executive Order 9396 (sec. I, Bul. 22,WD , 1943), superseding Executive Order 9075 (sec. III, WD Bul, 11, 1942), citation to the following unit in the General Orders indicated are confirmed under the provisions of section IV, Circular No. 333, War Department, 1943 in the name of the President of the United States as public evidence of deserved honor and distinction. 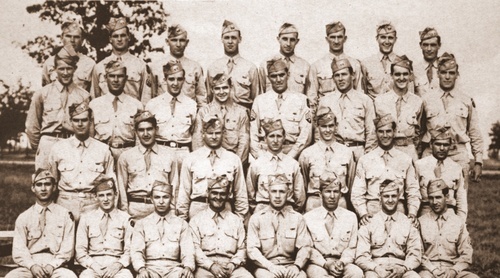 The 466th Parachute Field Artillery Battalion is cited for extraordinary heroism, efficiency, and achievement in action against the enemy near Wesel, Germany, on 24 March 1945. Jumping by parachute, north of Wesel,the 466th Parachute Field Artillery Battalion encountered some of the bitterest fighting in the accomplishment of the objectives assigned to the 17th Airborne Division. Landing in a drop zone completely covered by accurate fire from enemy artillery emplacements, this parachute field artillery battalion after gathering ammunition and howitzer bundles off the fire swept field, went into action to fire their first round within 30 minutes after getting to the ground. 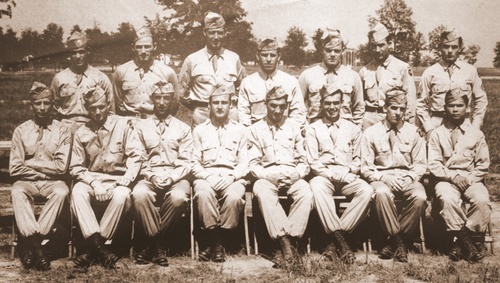 Although 1 Battery of this parachute field artillery battalion had lost all of its officers, the battalion's fire control was established within 1 1/2 hours and firing in direct support of a parachute infantry regiment. The 466th Parachute Field Artillery Battalion, in addition to accomplishing its assigned mission,succeeded in capturing 320 prisoners and capturing or destroying 18 field pieces and approximately 18 enemy machine guns. The profficiency and aggressiveness of the 466th Parachute Field Artilley Battalion, in the face of great odds and a defensively prepared enemy, resulted in the provision of adequate artillery support, which assisted materially in the ultimate success of the operation and subsequent explotation of the gains acheived. General Orders No 42 (GO 42) DEPARTMENT OF THE ARMY Washington 25, D.C., 25 August 1949. 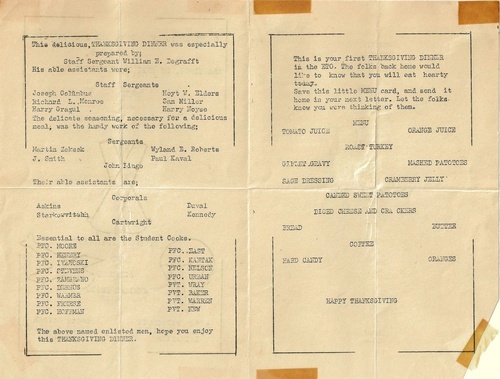 BATTLE HONORS Paragraph 9, section V, WD General Orders 119, 1946, pertaining to the 466th Parachute Field Artillery Battalion is amended to include Headquarters and Headquarters Battery, 17th Airborne Division Artillery. At D+1, on March 25, 1945 Pfc Francis B MARTIN and Pfc Michael C ZALEWSKI were killed in action. Pvt Harry K MEAKIN was killed in line of duty on March 27, 1945. April 12 : Huttrop. On April 14, 1945 T/5 Herbert C BABELAY was killed in action. April 17: Rhade. On April 19, 1945 Sgt Frank A SURIK was killed in action. On June 5, 1945 the 466th Parachute Field Artillery Battalion was ordered to move from Germany to Neufchâteau (France). It is at this place the Battalion was dissolved and the troopers sent in other units. On the road to Frankfurt ! These three photos (issued from the scrapbook of George S Meyers) were probably realised during the same trip but only one has a simple legend : "Frankfurt". 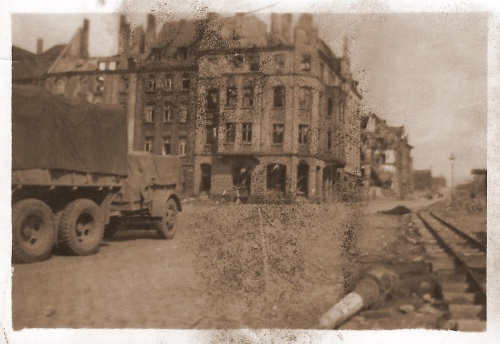 This city was not on the road of the 17th Airborne Division. May be the photos were realised after VE Day, during the transfer to Vittel ? (with courtesy of Michael Meyers).